We all have those days. You know the days where you’d give anything to run into your bedroom, close the door, throw the covers over your head and not come out until the Domino’s guy delivers. There’s no saving you now. Okay, maybe that’s a little bit dramatic. Below are some of my favorite ways to relax after work because a little R&R never hurt anyone. 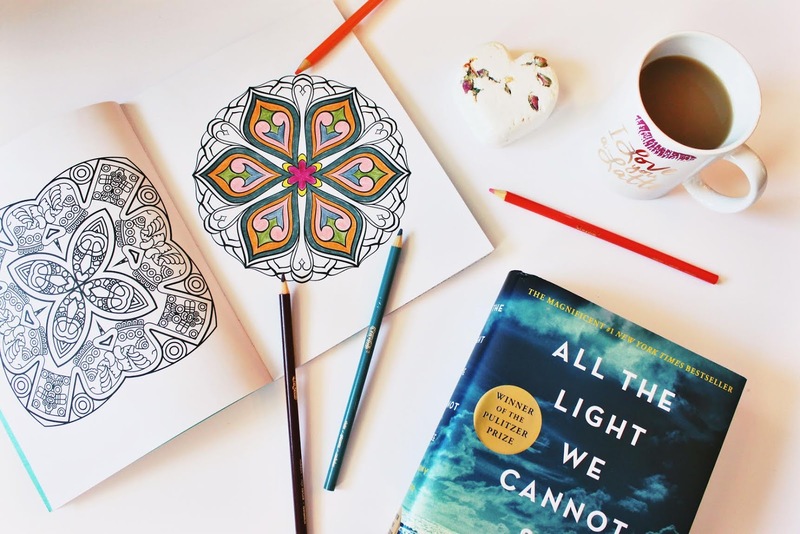 Adult coloring books have become quite the trend lately. When I first heard about them, I was skeptical because I couldn’t really see adults taking time out of their day to color. It turns out I was very wrong. There are so many different types of adult coloring books you can purchase off of Amazon if you’re interested. They take me back to my childhood and I actually really want to do a good job at coloring again. The book I have is called Zen and it’s composed of mandalas, which are typically used to help focus attention during meditation. My love for all types of food and more importantly a nice, home cooked meal has been ingrained in me from an early age. Thankfully, I grew up with a mother that cooked big meals for our family every night. And this made me really love food and look forward to stuffing my face. The best thing is when I’ve had a rough day at work and my co-worker buys a blondie from the cafe late in the afternoon and asks me if I want a piece. Why yes, thank you. I’d love half of your blondie actually. Don’t know what a blondie is? That’s terrible, google it now. I mentioned in a previous post how much taking a bath really influences my mood. Bath time is a relaxing way to wind down and get my mind back into a peaceful, positive place. I love to use Lush bath bombs as I find they add a little something extra special. Think of it as alternative medicine. Don’t have time for a long bath? Just let the hot water in the shower steam you up a little longer than you normally would. This might not be for everyone since I know reading isn’t exactly a hobby for many millennials these days. We are surrounded by Netflix and websites where you can watch free movies that are playing in movie theaters as we speak. I know competition is tough for a good old book or magazine to grab your attention. However, a great book really takes my imagination to another place unlike a tv show or movie. There is nothing better than escaping your current reality to a more interesting place, but in your own head. Need I say more? Didn’t think so. Maybe you like to play a sport or you enjoy painting or drawing. When I was a teenager, I used to play piano and guitar in my free time. Nothing crazy, I had a very basic skill set. Practicing was really calming and a great way to remove myself from school, homework and whatever else I was doing at that time in my life. Take some time to practice your hobbies especially if you’ve had a particularly long or rough day. It will make you feel more positive and ready to take on another day. Coloring is such a lovely way to relax! And the mandala coloring books are great, I have one myself. I love hanging up the finished pages to use later on for meditation, they're so therapeutic. Loved these tips! This post has reminded me I got myself a colouring book which I completely forgot about, I need to get it out and start colouring!